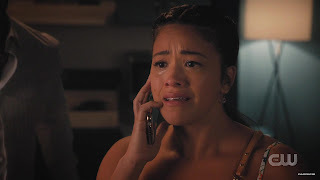 Jane the Virgin finally returned with “Chapter Eighty-Two” written by showrunner Jennie Snyder Urman and directed by none other than Jane herself – Gina Rodriguez! I loved that the CW changed their signature green to lavender for the show. We finally get some answers about Michael’s (Brett Dier) return – and there’s no doubt that it’s really him… just with no memory of any of them. The show gets meta again as the thread that runs through the episode is how we tell ourselves stories and make stories to remember those important to us to keep even the dead alive in the stories. The episode opens with an explanation of the Day of the Dead – Dia de los Muertos. People go to loved ones graves on this day and tell stories about them to help keep them alive. The painted faces are also a way to represent a deceased loved one and is also an expression of self. 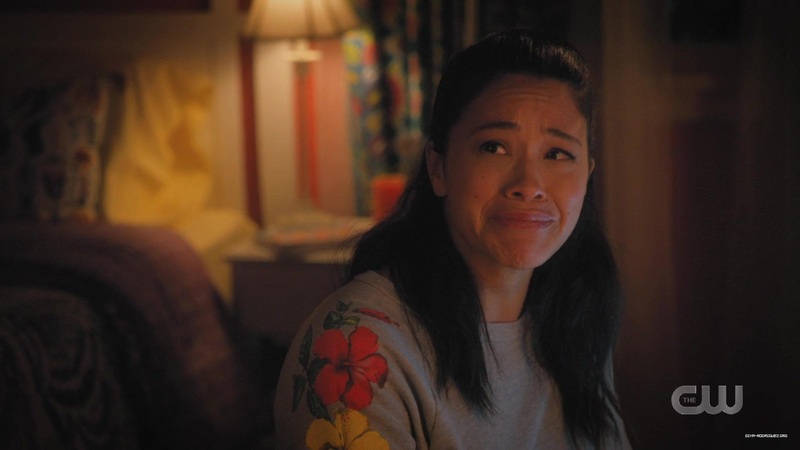 Once again, the show has found a wonderful metaphor that cuts across the many feelings that Jane is having – and the many feelings that we all have around the loss of loved ones. 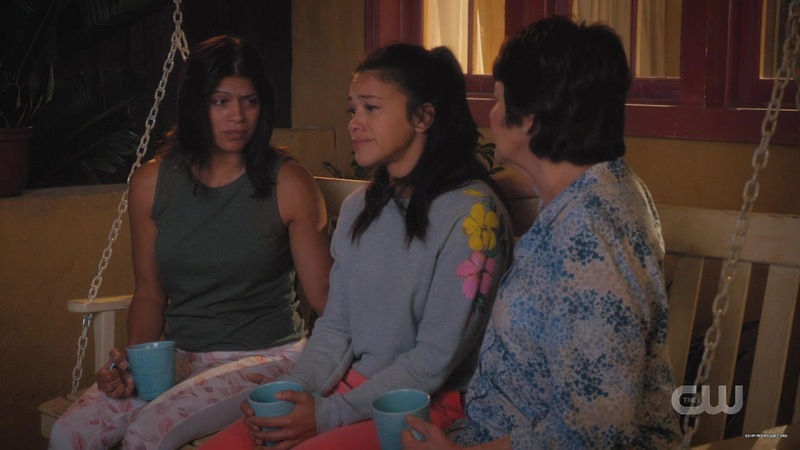 In the first scene we see young Jane (Julianna Gamiz) with Alba (Ivonne Coll) and Xo (Andrea Navedo) cleaning her Grandfather’s grave and hearing stories about him – fast forward to a devastated Jane crying over Michael’s grave four years ago. Three years ago, she is still crying; two years ago, they are laughing over the cat, and one year ago, they bring Mateo (Elias Janssen). The reappearance of Michael sends Jane into a tailspin. The titlecard also nicely reflects this as we see Virgin struck out and then Widow – to be replaces with a question mark. Our stories are how we construct ourselves, how we label ourselves. But Michael doesn’t remember her, and Jane feels likes she is now “the Forgotten.” Michael losing her memories and stories somehow diminishes Jane’s story. Rafael (Justin Baldoni) explains that Rose (Bridget Regan) faked Michael’s death, bribed the coroner, and elector-shocked Micheal’s memories away. Rafael did a DNA test – there’s no mistake. Michael now goes by Jason – after Jason Bourne. He woke up in Montana with no memory and is completely unlike himself, right down to now being a dog person – with Bo, his dog! It’s hysterical when Xo and Rogelio (Jaime Camil) call to find out about the engagement and find out about Michael and Rogelio faints! Jane leaves Michael at Rafael’s for the night, and they head to Alba’s. The next day, Rogelio prepares to be reunited with his bro-gelio – Camil is hysterical as always as he primps – pushing Jane out of the way at the mirror. Of course he’s sure that his mere presence will restore Michael’s memories! Michael’s mother Patricia (Molly Hagan) is thrilled to have him back – obviously – but expects Jane to simply pick up where they left off – and take care of getting Michael’s memories back. The doctor (Noel Arthur) tells them that the brain is not an exact science. Michael may or may not ever get his memories back. He suggests taking him back to familiar places and familiar people will help. It appears that all of Jane’s attempts fail. He no longer likes any of the things that he used to – and it’s really creepy when he’s clearly attracted to Petra! We get an absolutely brilliantly acted and directed scene from Gina Rodriquez as Jane freaks out while Xo and Alba sit at the kitchen table in stunned silence. The scene goes from commercial break to commercial break – about 6 minutes – and it is ONE. CONTINUOUS. SHOT! Jane goes through all of her emotions – is she still married? Jason smells just like Michael – but he doesn’t like jokes and talks really slowly – and he’s not a cat person! What is she going to do about Mateo? It’s just a brilliant scene. 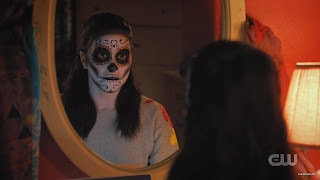 Jane is increasingly upset by going through videos and other momentos to try to jog Michael’s memory – and she sees herself with a day of the dead mask. She tells Xo she feels like she’s been erased and the Narrator points out that if you leave something out of a story, you change the whole story. We get a classic scene with Xo and Alba on the swing with Jane as they try to comfort her. Meanwhile, Xo has told Rogelio to be more sensitive towards Rafael, so he’s helping Rafael pack to move to the new apartment. Rogelio finds the engagement ring and Rafael walks in as he does. Rogelio suddenly realizes the horrible situation that Rafael is in and tells him that he’s come to love Rafael and think of him as family. It’s really only when Xo goes to check on Rafael that he breaks down and admits that he’s scared that he’s going to lose Jane. Michael/Jason – comes to Jane and apologizes. He knows he’s blowing her life up and offers to just go back to Montana. Jane turns to her writing. She deletes the sentence that says her husband died, and then starts to write their story – meeting, wedding, Michael’s death. 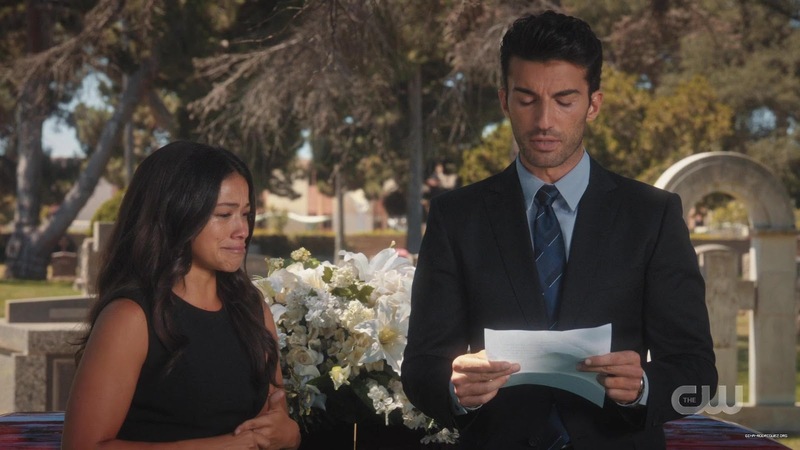 We see Jane trying to talk at the funeral and just too heartbroken to get through her speech, so even then, Rafael comes to her rescue, getting up and reading it for her. Suddenly, Jane knows what she has to do. The end of Michael’s story was the beginning of her story with Rafael. Just like Jane showed up at Michael’s work in the first season, she shows up at Rafael’s now. It’s his first day, so he takes her outside. She tells him that she’s moving in! She loves him for being so self-less – all four years – and for bringing Michael back. They kiss, but there's only one white petal... is this now reality, which doesn't come with romanitc petal showers? Was that a story they were telling themselves? Meanwhile, Petra deals with Milos’ disappearance. JR is worried about her but not enough to let her stay at JR’s own place. 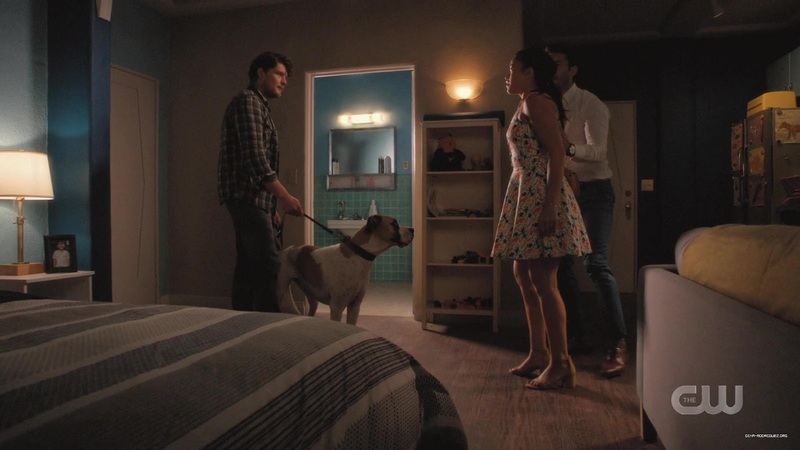 It turns out that Milos is hiding in a giant teddy bear in Petra’s apartment and offers to trade the hotel shares for antibiotics as his wound in now infected. JR comes to get her things and Petra tries to convince her that they can get through it. JR won’t budge because of the lies. Petra tries to explain that this is how she’s had to get through life and that she’s changed a lot – but it’s not enough for JR. Petra promises to change more, but JR says she can’t wait and that she can’t forget. I loved Petra saying she loved JR and JR saying “I know” – and Jane explaining Star Wars to Michael in the background. Finally, Luisa has been contacted by Rose because of Rafael having to give up her location. Luisa decides that she will help Rafael find out why Rose took Michael. Our last shot is that Rose is clearly up to something – she’s made a video to give orders of some kind to a group of women…. I loved the story thread of Dia de los Muertos that ran through this episode. I also like all the echoes of the past episodes. Great acting and directing as always from Rodriguez! I’m going to be very sad when this show reaches that 100th episode, but I think we are on the right track to really do the ending justice! What did you think of the episode? Let me know your thoughts in the comments below!